For Retailers | Starborn Industries, Inc.
Our national advertising campaign introduces Headcote to millions of customers across the country – including yours! Our full color ads in high-profile publications are part of our ongoing multi-tiered marketing program that also includes: direct mail, exhibitions and trade shows. When you sell Headcote, your store name is placed in our database, making it easy for us to let your customers know where to find you. We not only bring customers to your store, our Headcote display, packaging and brochure make it easy for them to select the Headcote product that is right for them. The Headcote Deck Pack POP display includes our nine best sellers (by size and color), a product mix that covers all deck and trimboard needs, and an informative header card. Our Deck Pack packaging features a clear lid and full color label that make it easy for customers to quickly identify screw type, color and application. And the Headcote brochure lists over 100 deck board brands and colors and the Headcote color recommended for each, in addition to other useful tips and information. Smart-Bit's unique features, such as its replaceable Powerbolic bits, have been featured in national trade publications such as Fine Homebuilding, This Old House, Professional Deck Builder and The Journal of Light Construction, among others. Its bold, eye catching red packaging (which also incorporates an anti-theft magnetic strip for added security) makes it easy for customers to spot Smart-Bit in your store. And because of the unique time and labor-saving features of Smart-Bit, you can count on word-of-mouth to keep sales momentum growing! The launch of Deckfast Composite as part of our national advertising campaign and multi-tiered marketing program will introduce Deckfast to millions of customers across the country – including yours! You and your customers will see our ads in Fine Homebuilding, This Old House, Professional Deck Builder and The Journal of Light Construction magazines, among others. Our bold, eye-catching packaging features a full color label that makes it easy for customers to quickly identify screw type, color and application. A Deck Pack display is available that features an assortment of product, creating a big profit center that takes up very little space. You and your customers will see our ads in Fine Homebuilding, This Old House, Professional Deck Builder and The Journal of Light Construction magazines, among others. 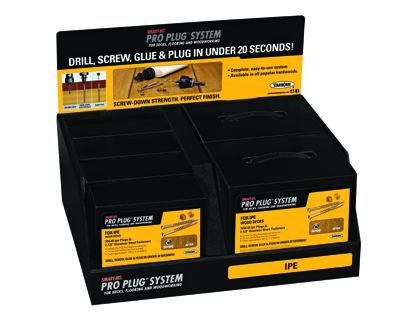 These ads highlight the aesthetic and time-saving benefits of the Smart-Bit Pro Plug System and prominently feature our bold, eye-catching packaging, making it easy for customers to spot the Pro Plug System in your store.